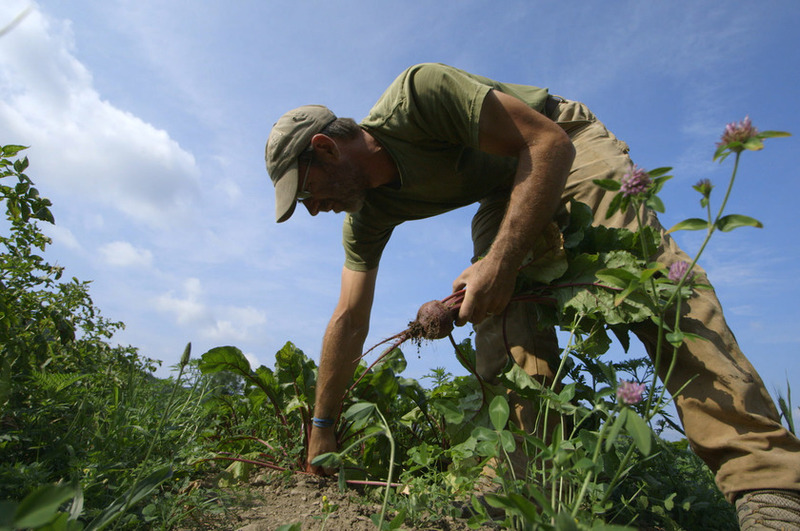 In Line Farm is a certified organic, diversified vegetable farm located in Schoharie, NY, nestled on a hillside just above the Schoharie valley floor that is home to world class soils. The farm is situated on the flat bottom of a bowl of mountains that surround the farm on three sides. Millennia of winter snow melt running down the mountain slopes and concentrated by the bowl shape onto the fields of the flat bottom have produced uncharacteristically high quality, if rocky (we don't grow carrots or parsnips), soils for a hillside farm. Our exclusive marketing focus at In Line Farm is building wholesale/commercial relationships, and as we are building those relationships, we strive to strengthen them and deepen them so that they become more than arms length relationships: mutually beneficial partnerships. Partner service and satisfaction are not an afterthought or inconvenience for us. Our attention to them is equal to our attention to farming. At In Line Farm we pride ourselves on producing the highest quality vegetables possible. However, production management is only one very important piece of the high quality puzzle. On the farm all vegetables are hand harvested, always at the peak of their maturity/ripeness. In the packing house, the highest quality items are individually hand selected, carefully washed (when appropriate) and then meticulously hand packed. From the field to the box, bag, or crate, this process ensures that the vegetables that go to our commercial/wholesale partners are free from bruises, scratches, and unsightly blemishes, and are packed so as to be maintained in their highest state of freshness during transportation and delivery. Finally, to those to whom it might be of interest, In Line Farm is also a veganic farm, one of merely a handful of veganic farms in the entire nation. (In veganic farming no animal products of any kind, such as manure or slaughterhouse by-products like blood-, bone-, or feather meal are used for soil fertility and quality. Veganic farms use only plant-based fertility inputs). Products Overview: We produce a wide variety of Asian greens and vegetables, including Baby Bok Choy, (Yu) Choy Sum, Gailan (Chinese broccoli), Chrysanthemum, Komatsuna, Mizuna, Mibuna, Red and Green Mustard, Okame (Arrowhead spinach), Tatsoi, and Vivid Choi. We also produce some more standard fare, including red, gold, and chioggia beets, green and haricot vert beans, a number of summer squash, including a few gourmet varieties like lemon yellow, Ronde de Nice, and Costata Romanesco (the last has incredible blossoms), and nearly twenty varieties of potatoes ranging from simple reds, whites, and golds to trippy purple Magic Mollies and a number of fingerlings. If there is something that is hard to come by that you are interested in, please let us know, we'd be happy to grow it for you.